Kid Friendly Halloween Treats - Perfect for a Halloween Birthday Party! Kid Friendly Halloween Treats – Perfect for a Halloween Birthday Party! If you’re planning a Halloween themed birthday or just a Halloween get together for your kids, here are some tasty kid friendly Halloween treats that you might include on your menu. They’ll be a big hit with the kids–not only will they enjoy eating these yummy treats, but they’ll love helping you make them too! Here’s a recipe I found at Parents.com with a few tweaks I added. Place chocolate frosting in a freezer-weight zip-top bag and snip off a small corner. Pipe base of cones, dip in orange nonpareils (orange colored sugar crystals) and set aside. Place 1/2 cup cream cheese frosting in a another zip-top bag and snip off a small corner. Tint remaining frosting green and frost cupcakes. Turn cupcakes on sides (so the front is facing you), then place decorated cones on top. Using cream cheese frosting, pipe eyes on cupcakes. Attach chocolate chips for pupils and pipe a dot onto chips. Use red icing for mouths, green icing for warts; shape candies into noses. Pipe chocolate icing onto cupcakes for hair and sprinkle with chocolate jimmies. Here’s a recipe I found at Epicurious.com that I think my son will LOVE! It’s made with peanut butter so beware if your child has a peanut allergy. Take the sheet of balls from the refrigerator; use a fork or a toothpick to dip each one most of the way into the chocolate, leaving a round or oval opening of undipped peanut butter on top. (This opening in the chocolate will be the cornea.) 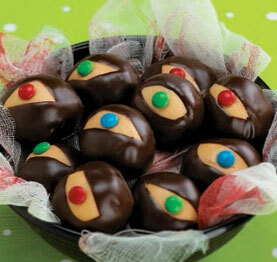 Hold each ball over the chocolate to catch the drips, and then return to the wax paper, cornea side up. Place an M&M in the center of the peanut butter cornea to make an iris. Refrigerate for at least 1 hour before serving. Store the eyeballs in the refrigerator or freezer and serve chilled. Here’s a recipe I found at Myrecipes.com. 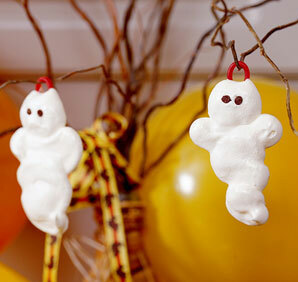 It involves a lot of work, but how cute are those ghosts? Beat egg whites and cream of tartar at high speed with an electric mixer until foamy. Gradually add sugar, 1 tablespoon at a time, beating until stiff peaks form and sugar dissolves (2 to 4 minutes). Add extract; beat until blended. Spoon mixture into a zip-top plastic bag; snip a small hole in 1 corner, and pipe mixture into ghostly shapes on parchment paper-lined baking sheets (here’s where the kids can get creative helping you!). Add mini morsels for eyes. If desired, cut licorice into 2-inch pieces. Firmly pinch ends together. Insert 1 in top of each ghost for a hanger. Bake at 200° Fahrenheit for 2 hours. Turn oven off, and let meringues stand in closed oven with light on 8 hours. 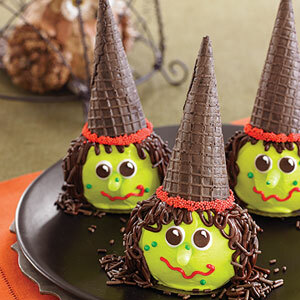 Hope you enjoy making these cute, kid friendly Halloween treats for your family. Come back and tell me how they turned out for you, or if you tweaked them to come up with your own modified versions! SO CUTE ! Don’t you just love FALL and the holidays, so many cute craft and food ideas. I altered all the recipes to be allergen free (gluten dairy soy and a million other things free!!!) & they turned out AWESOME at my DD’s party this past weekend! Plan to make them for her class for Halloween as well!!! Thanks!